To ensure an adequate dissemination of results and findings, Takiwasi presents his research and clinical experience at conferences in the field of health, participates in media outlets for scientific outreach and in international scientific forums. Conference by Matteo Politi, scientific director of the Takiwasi Center, organized by the Amici di Georgofili Association, held at the Museum of Natural History - University of Pisa, Italy, on Tuesday, March 12, 2019. 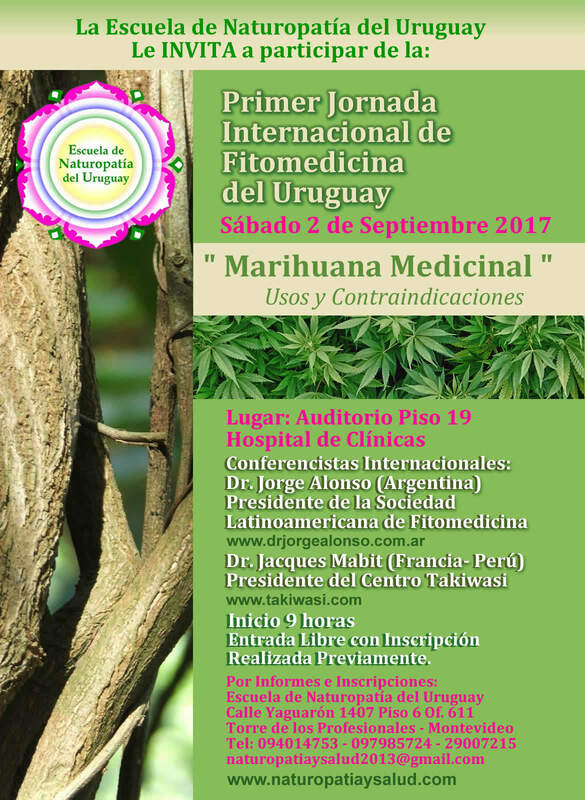 Lecture: "Traditional Amazonian medicine and its contemporary application in mental health"
International Multidisciplinary Congress of Medicinal Plants, Cochabamba, Bolivia, September 1-5, 2018. Speaker: Dr. Jacques Mabit. Presentation: "Takiwasi, an experience with traditional medicine in the Peruvian Jungle"
Congress of Traditional Medicine, Cutervo, Cajamarca, Peru, September 20-21, 2018. Speaker: Elizabeth García. Lecture: "Challenges of discernment between the psychic shadow and the spiritual shadow"
Cycle of conferences IDÉE PSY 2018 "From shamanism to psychotherapy: to the roots of care", June 6, 2018, Paris, France. Speaker: Dr. Jacques Mabit. Lecture: "The cruzadera: negative interferences according to the concept of traditional medicine"
Beyond Psychedelics Congress, 21-24 June 2018, Prague, Czech Republic. Speaker: Fabienne Bâcle. Lecture: "Addiction treatment in the Takiwasi Center"
Odborne Konference, June 22, 2018, Brno, Czech Republic. Speaker: Veronika Kavenská. Presentation: "Takiwasi: Therapeutic integration of the work with ayahuasca and master plants, a vision from Gestalt therapy"
2nd National and International Gestalt Therapy Congress of the Gestalt Center of Peru, May 4, 5 and 6, 2018, Lima, Peru. Speaker: Hugo Fernández. International Conference Sacred Plants in the Americas, February 23 to 25, 2018, Ajijic, Jalisco, Mexico. Speaker: Veronika Kavenská. 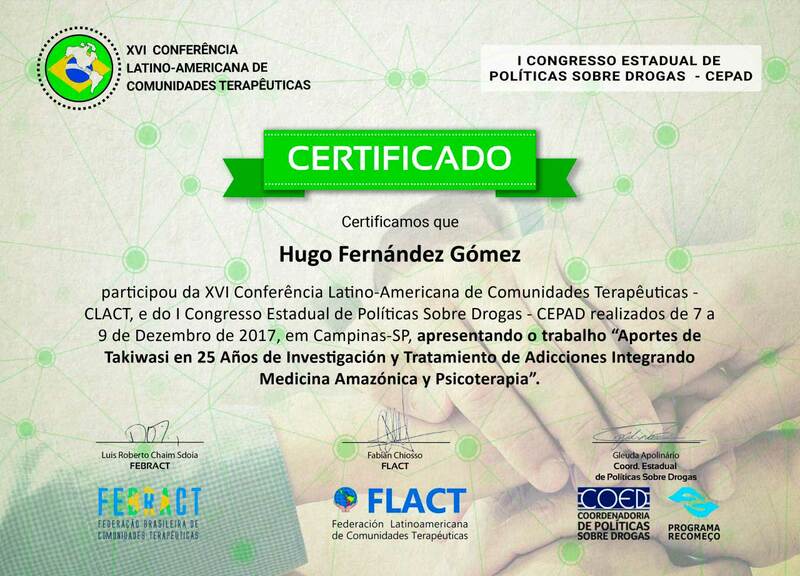 Lecture "Contributions of Takiwasi in 25 years of research and treatment of addictions integrating Amazonian Traditional Medicine and psychotherapy"
XVI Latin American Conference of Therapeutic Communities, 07-09 December 2017, Campinas, Brazil. Speaker: Hugo Fernández. International Transpersonal Conference. 28/9 – 1/10/2017, Prague, Czech Republic. Speaker: Dr. Jacques Mabit. International Transpersonal Conference, 28-29 September 2017, Prague, Czech Republic. Participant: Dr. Jacques Mabit. XXVI Italo-Latin American Congress of Ethnomedicine SILAE 2017 and IX Colombian Congress of Chromatography, Cartagena de Indias 25-29 September 2017. Researchers: Tresca, Garay, Politi. XXVI Italo-Latin American Congress of Ethnomedicine SILAE 2017 and IX Colombian Congress of Chromatography, Cartagena de Indias 25-29 September 2017. Researchers: Soffiato, Garay, Quinteros, Mendive, Politi. 2/9/2017, Montevideo, Uruguay. Speaker: Dr. Jacques Mabit. ISPOR 6th Latina American Conference. 15-17 September 2017, Sao Paolo, Brazil. Speaker: Triulzi, Politi, Mendive, Palla, Turchetti. Transpersonal Association of Perú, from 25 to 28 de May 2017, Lima – Perú. Speaker: Veronika Kavenská. Researcher Meeting VIII Foro Social PanAmazonico. 26 to 27 April, Tarapoto – Perú. Speaker: Joe Reategui, Matteo Politi. Researcher Meeting VIII Foro Social PanAmazonico. 26 to 27 April, Tarapoto – Perú. Speaker: Elizabeth Garcia, Jaime Torres. Conference “Adding rainforest remedies to addiction treatment: Patient characteristics at a pioneering substance use disorder treatment center"
XXII World Congress of the World Association for Social Psychiatry (WASP2016). 30 November - 4 December 2016, New Delhi, India. Speaker: Ilana Berlowitz. ISPOR 19th Annual European Congress. 29 October - 2 November2016, Vienna, Austria. Speaker: Triulzi, Politi, Mendive, Palla, Turchetti. II World Ayahuasca Conference, ICEERS Foundation, Rio Branco, Brazil, 21-10-2016. Speaker: Dr. Jacques Mabit. II World Ayahuasca Conference, ICEERS Foundation, Rio Branco, Brazil, 17-22 October 2016. Speaker: Dra. Rosa Giove. Interdisciplinary Conference on Psychedelics Research. 3 - 5 June 2016, Amsterdam. Speaker: David O’Shaugnessy. First Congress on “First Nations” of the Medical College of Chile, Concepción, Chile, 24-25 June 2016, Chile. Speaker: Dr. Jacques Mabit. Recherche et intervention sur les substances psychoactives, Université du Québec à Trois-Rivières, Canadá, 28-9-2015. Speaker: Dr. Jacques Mabit. EnCura, encontro de curadores e terapeutas do Santo Daime/Ayahuasca, Aracati, Brasil, 13-14-15 March 2015. Speaker: David Londoño Valderrama. 3rd International Conference and Exhibition on Traditional & Alternative Medicine, August 03-05, 2015 Birmingham, UK, Speaker: Ilana Berlowitz. Conversatorio del Observatorio de las Drogas, Eje cafetero, University of Pereira, Colombia, 18-9-2015. Speaker: Dr. Jacques Mabit. Dialogue « Dangers et nécessité de l’individuation », Bruxelles, Belgium, June 2014. Speaker: Dr. Jacques Mabit. with Piero Coppo (President of the Organization for Interdisciplinary Development in Health) and honorary vice-president of the Italian Society of Medical Anthropology (SIAM), and participants, Usigliano Di Lari, Pontedera-Casciana, Italy, June 2014. Speaker: Dr. Jacques Mabit. LH Forum San Patrignano, Rimini, Italy, June 2014. Speaker: Dr. Jacques Mabit. International NGO Summit on the Prevention of Drugs, Tobacco & Alcohol Abuse, Yogyakarta Muhammadiyah University, Yogyakarta, Indonesia, 3-6 February 2014. Speaker: Dr. Jacques Mabit. (Význam rituálu v terapeuticky navozených změněných stavech vědomí - na základě zkušeností z terapeutického centra Takiwasi v Amazonii), Société Tchèque de Psychanalyse Junguienne, Prague, Czech Republic, 21-9-2013. Speaker: Dr. Jacques Mabit. Maps Psychedelic Science Conference, Ayahuasca Track, Oakland (Ca), United States, 21-04-2013. Speaker: Dr. Jacques Mabit. Third National and International Day on Shamanism and Extended States of Consciousness. 30 November - 1 December 2012. Rosario. Argentina. Speaker: PhD Fernando Mendive. Organización Mundial de la Propiedad Intelectual, INDECOPI y Comisión Nacional contra la Biopirateria. 7 and 8 June 2012. Lima-Perú. Speaker: PhD Fernando Mendive. Conference: "De l’ouragan à la brise légère"
in « Série : Cris et chuchotements de l’âme », SavoirPsy, 2 de mayo 2012, Paris, France. Speaker: Dr. Jacques Mabit. Conference: "La médecine amazonienne dans les processus de libération"
in “Convergences cliniques de la psychothérapie et de la pratique exorciste dans les processus de libération.”, Ars, France, 16-18 September 2011. Speaker: Dr. Jacques Mabit. en Sesión I “Dependência: os centros de tratamento, sua visao e abordagem di problema” in Encontro “Ayahuasca e o Tratamento da Dependência”, Universidad de Sao Paulo, Brazil, September 2011. Speaker: Dr. Jacques Mabit. organized by the association GASS, Barcelona, Spain, October 2010. Speaker: Dr. Jacques Mabit. Conference: "Plantes psychotropes: voie de passage du monde sensible aux réalités invisibles"
in Jornadas de Estudios Internacionales sobre « Prácticas contemporáneas de las plantas psicotrópicas », Instituto de Etnología de la Universidad de Neuchatel, Switzerland, 28-29 October 2010. Speaker: Dr. Jacques Mabit. Foundation for Revitalization of Local Health Traditions, Bangalore, India, 7-20 November 2009. 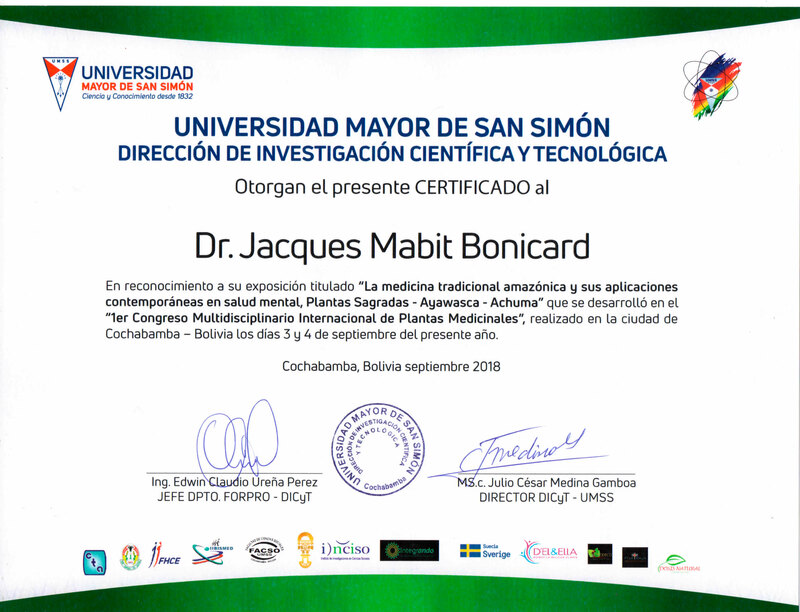 Participant: Dr. Jacques Mabit. Presentation: "Addictions: the erratic search for the meaning of life"
XXIV World Conference of Therapeutic Communities, An Alternative to Human and Social Development, Lima, Peru, February 6-10, 2009. Speaker: Jaime Torres. Conference: "Héritages transgénérationnels : de la servitude à la filiation"
IdéePsy, Forum 104, Paris, France, 6-02-2008. Speaker: Dr. Jacques Mabit. Conference: “La psychothérapie comme voie d'apprentissage de l'amour?" IdéesPsy, París, 4-10-2006, France. Speaker: Dr. Jacques Mabit. XII National Congress of Psychology and II International Congress of Psychology, Lima, Perú, August 2005. Speaker: Dr. Jacques Mabit. at the International Conference: "Drugs: New perspectives and approaches", DEVIDA - National Commission for Development and Life without Drugs, Centro Cultural Ricardo Palma, Lima, Perú, 6 September 2002. Speaker: Dr. Jacques Mabit. International Congress of the International Society of Medicine of Addictions (ISAM), “Addictions 200+1 ; Challenges and Opportunities for a New Millennium”, Tel-Aviv, Israel, September 2001. Speaker: Dr. Jacques Mabit. in « NDE, phénomènes de conscience et approche de la mort, du point de vue des médecines traditionnelles relativement à la médecine occidentale », International Association for Near-Death States – France, Coloquio “El cuerpo médico frente a las NDE o EMI”, Paris, Francia, June 1999. Speaker: Dr. Jacques Mabit. Conference: "Traditional Medicines of the World for the Recovery of Drug Addicts"
1st National Congress on Drug Use and Dependence, Peruvian Psychiatric Association, Lima, Peru, December 1997. Speaker: Dr. Jacques Mabit. Conference: "Go and return: the ritual as a gate between the worlds"
International Seminar on Drug Use and Abuse, ‘Primer Encontro de Estudos Sobre Rituais Religiosos ou Sociais e Uso de Plantas Psicoactivas’, CETAD y UFBA, Salvador de Bahía, Brazil, October 1995. Speaker: Dr. Jacques Mabit. Conference: "Drug-based counter-initiation versus shamanic initiation"
II International Congress for the Study of Modified States of Consciousness, Ethnocognition, Shamanism, Plants and Cultural Context, Lérida, Spain, October 1994. Speaker: Dr. Jacques Mabit. II International Congress of Traditional Medicines, Medical Anthropology Section, Chapter Lima, Perú, July 1988. Speaker: Dr. Jacques Mabit.